RALEIGH, N.C. - April 16, 2018 - PRLog -- New Covenant is excited to announce that Caleb Weger has joined the Wendell, NC based vocal group. Caleb has begun rehearsing with the group and is expecting to start performing with New Covenant in April. 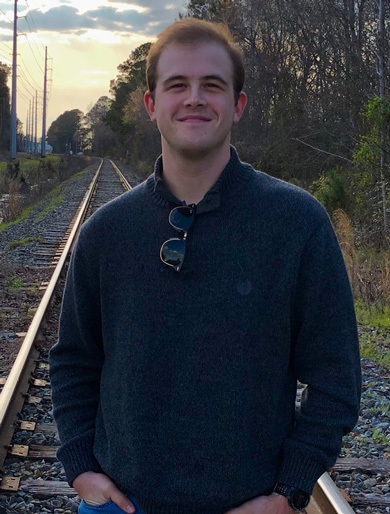 Caleb, a Wendell, NC native, is a full-time student at East Carolina University where he is majoring in finance. Like the rest of the group, Caleb is a member of Central Baptist Church, also in Wendell, NC. In addition to being a singer Caleb is also a guitar player and songwriter, which will help the group pursue developing original songs and add a new element to their performances. "Having the opportunity to join New Covenant has been nothing short of a blessing. It is very hectic, but in the same respect incredibly exciting. I know that God is working through this group, and that they are heading in a direction that is going to have many more blessings and opportunities to worship. I am excited to see what the future holds." says Caleb. The members of New Covenant had this to say: "Caleb brings a fresh sound, that is grounded in tradition, to New Covenant. He blends very well with us, both musically and through his faith. He has a style that lends itself to the continued success of our group and to our message. His vision to bless Christ through song and music is infectious and we're looking forward to how God is going to bless others, and New Covenant, through his witness in music." New Covenant, formed in 2001, originates out of Wendell, North Carolina. The singers met at Central Baptist Church and are all currently members - which brings a strong continuity to the group. New Covenant is best described as a unique blend of Contemporary Christian, Praise and Worship, and Southern Gospel music. New Covenant is comprised of singers, Larry Johnson, Sherry Gammon, Joanna King, Jeremy Gamble, Angela Millenbaugh, and the group's newest member, Caleb Weger. Collectively, the singers bring an extensive background and experience in the music arena. From trios, quartets and choirs to professional bands, in addition to instrumental, songwriting, radio and studio work, each member brings a special flavor of talent that enhances their overall essence as a performing group.